Perth, WA South Coast. 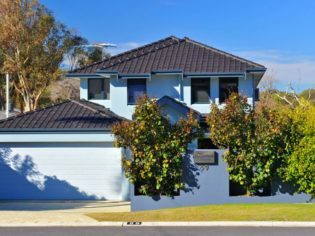 Trigg Retreat is a 15-minute drive from Perth’s CBD, a three-minute drive to Karrinyup shopping complex and has public transport in the same street for easy access to the city and surrounds. Trigg Beach is a 400 metres walk away, while Scarborough, City and Sorrento beaches, as well as many other beachside cafés, are within walking distance. Rated four-and-a-half stars, Trigg Retreat is a two-storey house comprising three tastefully furnished queen-sized guest rooms. Each includes an ensuite bathroom, air conditioning, television, DVD player, fridge, tea- and coffee-making facilities, electric blankets, safe, clock radio, ironing board and iron, wi-fi accessibility, and daily bedside chocolates. The tariff includes a gourmet continental breakfast, but there is also an extensive hot breakfast menu for $10 per person, including lemon and banana pancakes with berries, eggs benedict, and vegetable frittata. Notably, the retreat was awarded Bronze at the WA Tourism Awards for Hosted Accommodation in 2009, and was a finalist in 2008 and 2010. From $170 per couple per night.